An Ottoman legacy, baklava is one of the greatest creations from the pastry chefs at the Topkapi Palace. Generally, baklava is enjoyed as a mid-morning sweet snack with a cup of Turkish coffee, or as a mid-afternoon treat with a glass of tea or after lunch or dinner. There is no bad time for a good piece of baklava! The real thing shouldn’t be very sweet and heavy; on the contrary it should be light enough to tempt you to eat a small plateful. 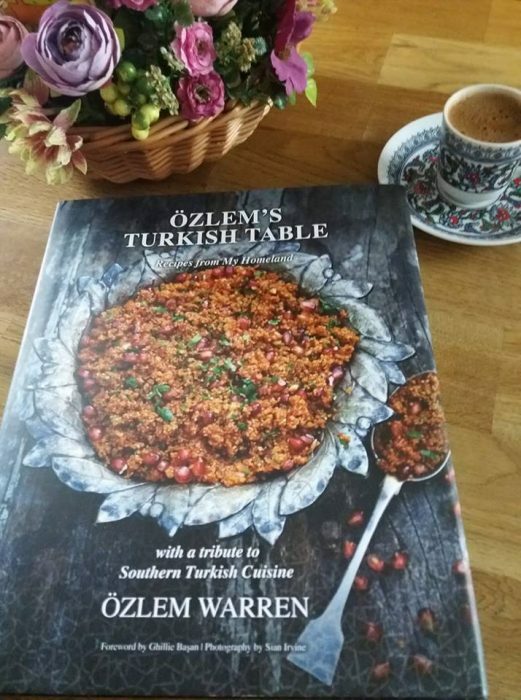 Baklava recipe and many delicious Turkish recipes are included in my cookery book, Ozlem’s Turkish Table, Recipes from My Homeland, available to order at this link. 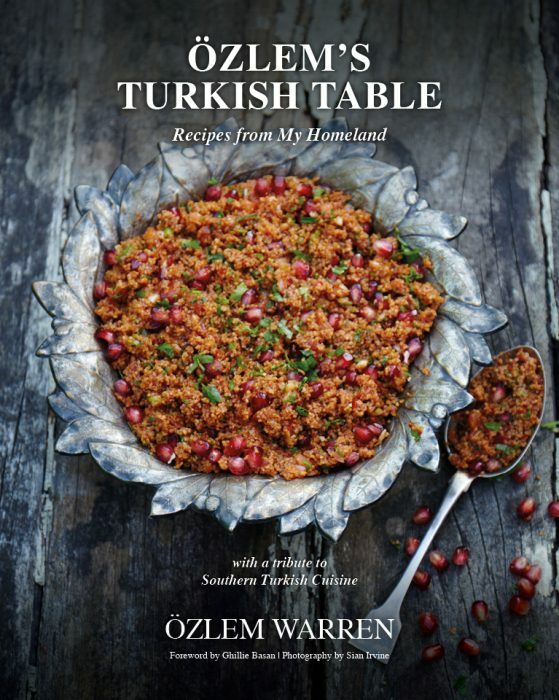 This recipe is an adaptation from Ghillie Basan’s The Complete Book of Turkish Cooking, one of my favorite Turkish cookery authors. My version of baklava is less sweet and more fragrant and lemony, must say really pleased with it. With using filo pastry sheets, baklava is much easier to make than you think. I hope you would give it a go sometime and enjoy this wonderful treat. Home-made baklava; delicious and easier than you think! Make the syrup first. Put the sugar into a heavy pan, pour in water and bring to the boil, stirring all the time. When the sugar is dissolved, lower the heat and stir in the lemon juice, them simmer for about 15 minutes, until the syrup thickens. Leave to cool in the pan. Melt the butter in a small pan and then brush a little over the bottom and sides of the baking pan. To thaw frozen filo sheets, it is best to place it in the fridge the night before and bring it to room temperature 2 hours before using. If in the fridge, take out the filo pastry sheets 20 minutes prior using, to bring to the room temperature. Place two sheets of filo pastry in the bottom of the greased pan and brush it with melted butter (trim from the edges to fit, if needed). Continue until you have used 12 filo sheets, brushing every two sheets with butter. Ease the sheets into the corners and trim the edges if they flop over the rim of the pan. Spread the walnuts over the 12th buttered sheet and sprinkle with the cinnamon, and then continue as before with the remaining filo sheets. Brush the top one as well, then, using a sharp knife cut diagonal parallel lines right through all the layers to the bottom to form small diamond shapes. Bake the baklava into the oven for about 45 minutes or until the top is golden – if it is still pale, increase the temperature for a few minutes at the end. When the baklava is ready, remove it from the oven and slowly pour the cooled syrup over the piping hot pastry. Return to the oven for 2-3 minutes to soak up the syrup, then take it out and leave to cool. Once the baklava is cool, lift the diamond shaped pieces out of the pan and arrange them in a serving dish. Serve baklava pieces with ground pistachios over them, always at room temperature. Note: Baklava should never be stored at the refrigerator, as the fat congeals, pastry absorbs the moisture and it becomes soggy. 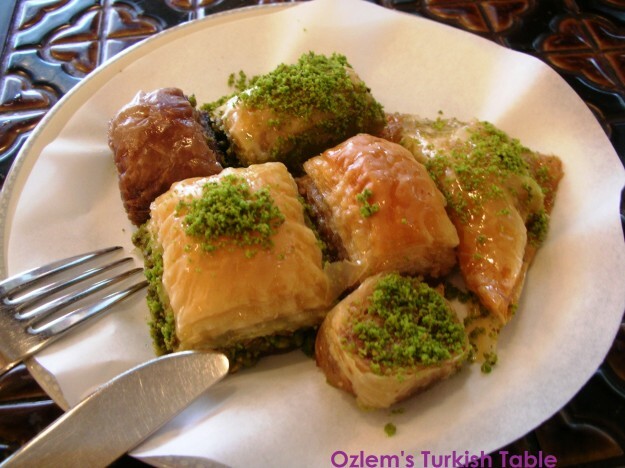 Your baklava looks so mouthwatering Özlem! Perfect treat for any celebration! I love when it’s not too sweet, and flavoring it with lemon is a great idea! Phyllo sheets’i tek tek ust uste aralarini hic yaglamadan seriyorum, orta kisima cekilmis “pecan nut” koyuyorum, ve her yaprak bitene kadar sermeye devam ediyorum. Bu islem bitip baklavayi dilim dilim kestikten sonra tereyagi yada zeytinyagini ustunde gezdirince, yag, hem o an, hemde piserken her katin arasina, kendiliginden yayiliyor, aynisi serbetini dokerken de oluyor. 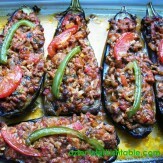 Boylece baklava yapimi cok kolay oluyor, yurt disinda yasayanlara bu yolu tavsiye ederim. Merhabalar, paylasiminiz icin cok tesekkurler, bu metodu denemek isterim – ellerinize saglik. Hi,thank you for the great baklava recipe. I made it and it turned out amazing. I am an Iranian Azeri living in orumieh near Turkey and I have traveled to Turkey several times and oh I love Turkish baklava. Again I thank you for this recipe. I will be making this over and over again ! 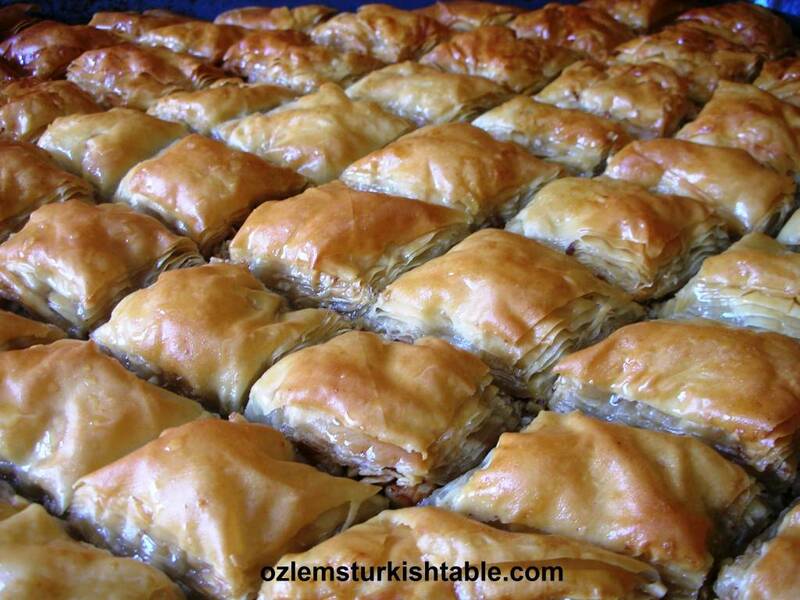 Merhaba Maryam, many thanks for your comment, glad you enjoyed your home made baklava! Filo pastry sheets vary from country to country (size as well as texture, some more moist, some drier), so that may be an effect. Once pouring the syrup baking again for3 – 5 mins helps to puff up, perhaps a little more time baking to get that puffy, crispy texture. You can also use less butter if you prefer. Generally the bottom half is moister than the top half, as it absorbs more syrup. Hope this helps, do let me know if you have any other questions. Hello there, Can vegetable ghee be used instead of butter? 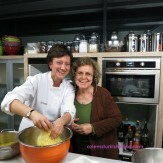 Merhaba, sure, you can use – hope you enjoy making baklava at home. Hi, is it possible to replace the sugar syrup with honey? Hello Adrian, thank you for stopping by – you can use honey instead though honey will be more intense and richer so you need to adjust the amount to your taste, hope you enjoy it. How far in adavance can I make this for an event? How do you store it? 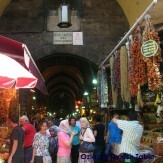 Thank you for sharing my baklava article! Many thanks for your kind mention! Leave a Reply to Shima Click here to cancel reply.